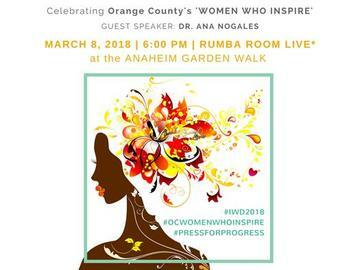 Join Dr. Ana Nogales on Thursday, March 8, 2018 from 6-8pm at the Rumba Room Live in the Anaheim Garden Walk as we celebrate International Women's Day #IWD2018. Dr. Nogales & Casa de la Familia will recognize several Orange County "Women Who Inspire". (3) of our honorees are award-winning authors! We'll have their books available and their autographs, too. Thanks to the International Women's Day for featuring our local event celebrating #IWD2018!!!! *Proceeds benefit Casa de la Familia (CDLF) providing mental health services to Orange County children and families since 1996. Note: Are you a women-owned, small business in Orange County and want to support?